RANCHO CUCAMONGA, Calif. (June 2012) – Bradshaw Home, Inc. a leading marketer of housewares products and best known for its flagship brand, Good Cook®, today announced the appointment of Brett Bradshaw, President of Bradshaw Home, Inc., to the Board of Directors of the International Housewares Association (IHA). Effectively immediately, Mr. Bradshaw will serve a 3-year term where he will join a distinguished group of 15 industry leaders who are charged with determining the strategic direction of the IHA—a vibrant organization with more than 2,000 manufacturers and distributors from all over North America and the world. Phil Brandl, President of the International Housewares Association stated, "Brett went through a formal selection process by the board and we are extremely happy to have him on our team. He represents a new generation of dynamic young leadership in our industry." “The IHA board of directors is always comprised of a distinct group of pioneers in the housewares industry, so it really is an honor to be able to collaborate with them on the direction of the IHA,” said Brett Bradshaw. In addition to providing its members with market data, education and business services, the IHA organizes and operates the annual International Home & Housewares Show; the premier industry event on every housewares company calendar. Bradshaw Home is a privately owned company based in Rancho Cucamonga, Calif., with family heritage dating back to 1905. Bradshaw International is a premier marketer of housewares in the U.S., and the largest kitchen gadget supplier in the world shipping more than 150 million pieces annually. 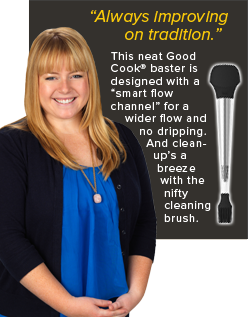 Its family of brands span the areas of kitchen tools & gadgets, cookware, bakeware and cleaning products, which includes: Good Cook®, Bonny, Profreshionals™, Bialetti, Oneida®, Betty Crocker®, Butler®, a division of Bradshaw Home; Mr. Clean®, Dawn®, and Black and Decker®. For more information about Bradshaw Home or its products, please visit www.bradshawhome.com.